A Saheb. Minimal Access Open Carpal Tunnel Release - A New Technique. The Internet Journal of Hand Surgery. 2019 Volume 9 Number 1. Carpal Tunnel Syndrome, an entrapment neuropathy of the median nerve in its passage across the wrist, was described by Paget in 1854 (1). This condition is believed to affect 3.8% of the population (2). It represents 90% of all entrapment neuropathies (3). Its prevalence is 9.2% in women and 6% in men but women can be affected 3 times more than men (4). Its prevalence in pregnancy is about 2% (5) and in diabetic patients with neuropathy is 30% and without neuropathy is 14% (6). This condition affects the middle-aged people between 40 and 60 years of age (7). It is often bilateral in about 60% and if unilateral affects the dominant hand. The symptoms start gradually. They can be characterized as burning, unpleasant tingling, itching, numbness, feeling of swelling (though there can be no evidence of swelling), clumsiness, objects falling from hand, decreased grip strength and wasting of thenar muscles. The feeling of swelling has high diagnostic value (8). Night symptoms are common with the patient waking up with ‘pins and needles’ sensation and shaking the hand to relieve the symptoms, called as the “Flick sign”. Often the symptoms do not consign to median nerve distribution. They can cross over to the ulnar nerve distribution. Steven et al in 224 patients with electro diagnostically confirmed CTS, noted that a large number of patients had symptoms affecting both median and ulnar nerve dermatomes, followed by median nerve area alone (9). This can be explained by the communication between the median and ulnar nerves as in Martin Gruber anastomosis in the forearm and Riche Cannieu anastomosis in the hand, with a prevalence of 38% in the former (28) and 60 to 80% in the latter (29). Other than digits, the symptoms of pain and paraesthesia can affect the forearm (21%), elbow (13.8%), shoulder (6.3%) and even neck (0.6%) (9). Trigger fingers can be found in about 20% of patients with CTS (10). CTS symptoms can be divided into three stages. The first stage is mild with nocturnal symptoms of pain and paraesthesia with the classical ‘Flick sign’, where the patient wakes up shaking his hand to get relief. In the second stage the symptoms are found in the day time also with some motor affection with feeling of clumsiness. In the third stage which is severe, the thenar muscles are wasted and there are pronounced motor symptoms. Paradoxically, pain and tingling are less and numbness is more in this stage. In the first and second stages, the sensory symptoms are substantial and in the third stage there is more functional limitation and less tingling and pain. Surgical outcome is good in the first and second stages and poor in the third stage (11). Sometimes patients do not present with classical symptoms described above, but with atypical signs like “writer’s cramp” or fatigue (12), pain in the shoulder, cold sensitivity in fingers (13), forearm pain only and numbness in middle finger only (14). In the last stage they sometimes present with no symptoms but only wasting of thenar muscles. Normal pressure recorded in the carpal tunnel is 2 to 10 mm of Hg (15). Wrist flexion increases the pressure 8-fold. A pressure of 20 to 30 mm of Hg can impair the venular flow in the epineurium and in CTS, pressure of 20 to 30 mm of Hg has been recorded with the wrist in neutral position which increased to 90 mm of Hg with the wrist flexed (16). The causes for median nerve compression can be classified as anatomical, physiological and patterns-of-use factors. Anatomical factors can be intrinsic as in increase in the contents of the carpal tunnel caused by benign tumors, abnormal muscle bellies, synovitis, hematomas and extrinsic as in causing decrease in the size of the tunnel as in osseous abnormalities affecting the corpus and distal radius and acromegaly. Physiological factors include neuropathic conditions like diabetes, alcoholism and altering fluid balance as in pregnancy, menopause, use of oral contraceptives, hypothyroidism, obesity, renal failure, congestive cardiac failure (17). Patterns-of-use factors relate to activities involving repetitive flexion and extension of the wrist and digits, use of vibratory tools and weight bearing on the carpal canal with the wrist extended as in cane or crutch walking (16). In Europe in 1998, 60% of work related musculo-skeletal disorders (WMSD) was CTS (18). Often no cause can be identified for carpal tunnel syndrome. The diagnosis of carpal tunnel syndrome can be arrived by obtaining careful medical history, physical examination involving sensory and motor examination and by doing provocative tests like Phalen test and eliciting Tinel sign. Phalen test has a sensitivity of up to 73% and specificity of up to 94% (19). Tinel’s sign has a sensitivity of up to 73% and specificity of up to 98% (19). Electro physiological tests like nerve conduction studies help to determine the diagnosis and to ascertain the severity of the condition. Abnormal conduction values like reduced sensory amplitude are diagnostic. Apart from this X rays can be taken to detect osseous abnormalities. Use of US, CT and MRI are not routinely recommended though they can offer additional information. Laboratory tests can be ordered wherever indicated like in Diabetes, Rheumatoid arthritis, gout and hypothyroidism. Other conditions that can mimic CTS have to be kept in mind like C6-C7 radiculopathy, Pronator Syndrome, Anterior Interosseous Nerve Syndrome, Thoracic outlet syndrome, certain CNS disorders and multiple sclerosis. Conservative treatment gives short term relief and can be employed in early stage of the disease and also while waiting for surgery or diagnostic test results. Marshall et al in a systematic review showed that conservative treatment including steroid injections gives relief only for about one month (20). NSAIDs, Vit B6, Vit B12, diuretics, steroid injections, gabapentin, pregabalin, wrist splints, yoga can all be used to obtain temporary relief (20). If any underlying disorder is detected, that can be treated. Rest or frequent breaks from jobs triggering CTS will help to reduce the symptoms. Data entry workers can be provided with ergonomically designed devices to alleviate symptoms. Qiyun Shi has published that surgical decompression gives 70 to 90% long term symptomatic improvement and restoration of normal nerve conduction results compared to conservative treatment (21). There is 24% increase in the volume of the carpal canal after surgical decompression (16). Open carpal tunnel release remains the gold standard of treatment. Mini open CTR with or without device assistance and Endoscopic carpal tunnel release are other techniques employed. Each claim benefits over other techniques. Most of the surgical complications are avoidable. They are incomplete resection of the transverse carpal ligament, incorrect diagnosis, painful scar, injury to median nerve, recurrent thenar branch, palmar cutaneous branch, common digital nerves and the superficial palmar arch, reflex sympathetic dystrophy, palmar heel pain, bowstringing of flexor tendons and median nerve tenderness. Advent of minimally invasive surgical techniques using endoscope led to the development of endoscopic CTR. 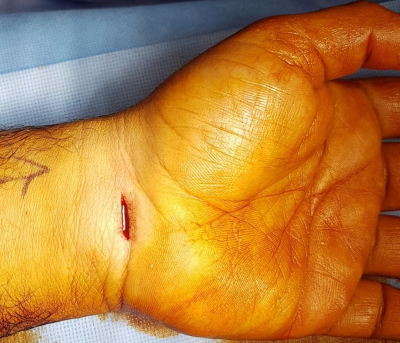 Moreover, palmar skin, which is richly innervated and thus sensitive, leading to scar tenderness, is not violated with endoscopic approaches as against open techniques. The advantages that were claimed with ECTR are faster functional recovery, faster return to work and less scar tenderness. But these advantages were offset by longer operating time, higher risk of nerve injury, higher recurrence rate, higher reoperation rate and higher cost. Moreover, comparative studies showed though there is definite advantage in functional recovery in the short term, the outcome was similar after six months. Isam Atroshi in his randomized control trial comparing the two techniques observed that scar tenderness was found in 82% after OCTR and 52% after ECTR. There was no difference between the two techniques in all other outcomes. He concluded that though there is less post-operative pain, the small size of benefit and similarity in other outcomes makes the cost effectiveness of ECTR uncertain (22). In the systematic review of randomized clinical trials of the two surgical treatments published in BJS 2001, ECTR and OCTR were found to be equally effective (23). A meta-analysis of randomized clinical trials comparing both techniques published in Plastic Reconstruction Surgery 2004, ECTR proved a quicker return of strength and less scar tenderness but there was 300% greater chance of nerve injury (24). According to the guidelines issued by AAOS in 2008, both methods were deemed equally effective (25). Higher recurrence rate was observed after ECTR as published in Plastic Reconstructive Surgery in 2000 (26). Chow observed higher rate of incomplete release after ECTR in his 13 years of experience, in the article published in Journal of Hand Surgery in 2002 (27). Hence the question…Does patient have to accept a higher risk of revision surgery and three-fold higher risk of nerve injury with ECTR for the benefit of earlier return to work? A new technique which includes the benefits of ECTR like faster functional recovery and less scar tenderness without the high cost involved is described here. The technique does not employ incision over the sensitive palmar skin and does not affect the palmar fascia. 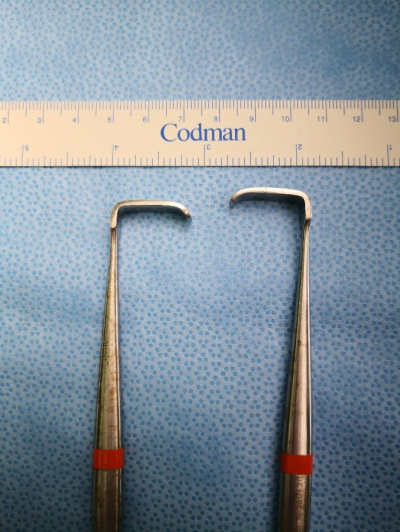 A blunt tipped Metzenbaum scissors (Fig 1) is used to divide the carpal ligament and a Senn Miller retractor (Fig 2) for tissue retraction. The surgery is generally done under local analgesia with or without I.V sedation. Addition of few ccs of adrenaline 1:100,000 solution to the local anesthetic will help in controlling bleeding or a tourniquet can be used. 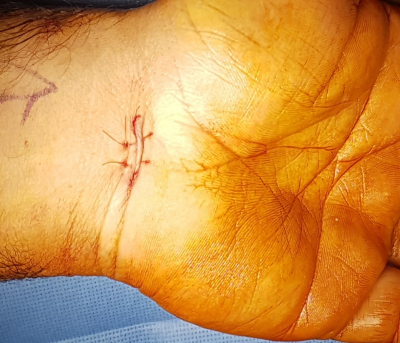 A 1 cm incision is placed along the wrist crease at the junction of the palm with the wrist. The incision is placed over the center over the palmaris longus tendon. It can be placed slightly towards ulnar side (Fig 3). 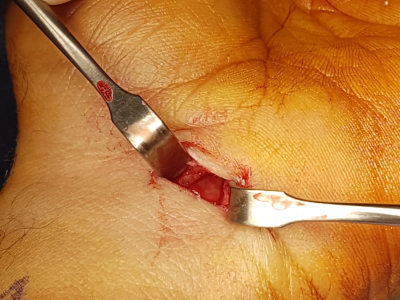 The soft tissue is dissected with a mosquito forceps to reach the transverse carpal ligament. Palmaris longus tendon is retracted medially. The tissues need to be dissected distally and proximally superficial to the ligament. Senn Miller retractors are introduced. A small nick is made in the carpal ligament with a 15 # blade. The rent is slightly widened with a mosquito artery forceps. 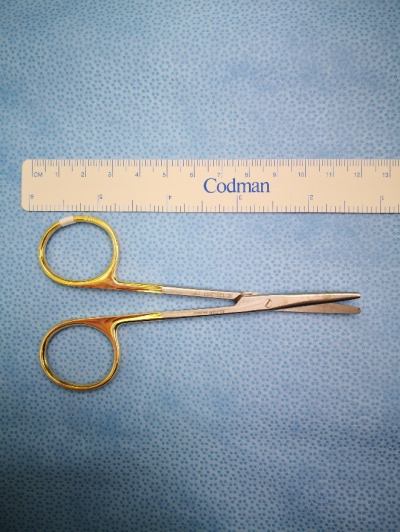 A blunt tipped Metzenbaum scissors is now used to divide the ligament. One blade of the scissors can be turned longitudinally slightly to introduce it under the ligament. While cutting, the handle is depressed down so that the tip of the scissors lifts up the carpal ligament. The ligament can be thus divided in segments in one go by pushing the tip of the scissors slowly without removing it or the scissors can be removed and reintroduced to cut the ligament in short segments. One operating light should be kept low so that the light shines deep into the wound and this can be facilitated by lifting the retractor to lift up the soft tissues. A mosquito forceps can be introduced under the ligament to check if the ligament is completely divided. The ligament must be divided in line to the ring finger. This will safeguard the thenar branch and the palmar cutaneous branch from getting injured. A final give way will indicate the ligament is completely divided and this can be ascertained by introducing the mosquito artery forceps with its tip facing upward. Then the forearm fascia is also divided proximally for about two centimeters (Fig 4). The wound can be closed just by suturing the skin with 4-0 non-absorbable suture (Fig 5). A soft comfortable dressing is placed and the wrist wrapped with soft cotton roll and a elastocrepe bandage. No post op splint or POP slab is used. This is a minimally invasive surgery with faster recovery and quicker return to work. Since the palmar skin and palmar fascia are not violated, there is less post-operative wound pain and scar tenderness. The operating time is on an average 10 to 15 minutes. Instruments are minimal and hence the cost is low as compared to ECTR. The outcome is good. Most of the complications related to CTR surgery can be avoided with care and skill. A sample survey was conducted on one hundred patients three months after surgery. A simple questionnaire was devised to assess patient satisfaction regarding their symptoms. Complete Satisfaction rate was about 91%. Out of the above one hundred patients, one required a re operation due to incomplete release, two developed palmar haematoma which resolved spontaneously, 6 had palmar heel pain. None had any nerve injury. Keep the incision central or slightly to ulnar side. Dissect tissues superficial to the transverse ligament and forearm fascia. Divide forearm fascia proximally for about two centimeters from the incision. Carpal tunnel syndrome is a common entrapment neuropathy, whose symptoms can easily be alleviated by simple surgical procedure. The new technique described here has advantages of limited incision, fast recovery and fast return to work with minimal cost and minimal operating time. 1. Paget J. Lectures on surgic pathology. Philadelphia: Lindsay and Blakiston; 1854. 13. Sakellarides HT. The management of carpal tunnel compression syndrome. Follow-up of 500 cases over a 25 year period. Orthop Rev. 1983;12:77–81. 28. Ahmedzateh J,Mansouri K, The study of Martin Gruber anastomosis and its prevalence, The Journal of Urmia University of medical sciences, 2001, Vol 12, # 4.